A suspected U.S. missile strike hit a village well inside Pakistani territory Wednesday, officials said, killing six alleged militants and indicating American willingness to pursue insurgents beyond the lawless tribal regions. The strike was the latest in a surge of cross-border attacks in Pakistan's militant-plagued northwest in the last three months that have killed scores of suspected al Qaeda and Taliban militants, but have enraged the country's civilian leadership. The attack was the first to hit an area outside the semiautonomous tribal belt that directly borders Afghanistan, something that could trigger extra anger among Pakistanis. 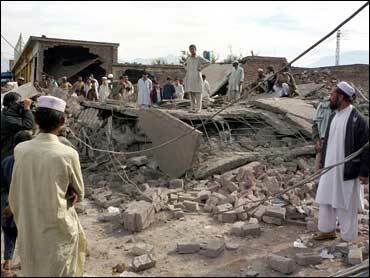 Javed Marwat, a local government official, told The Associated Press that two missiles destroyed a house in Indi Khel village in Bannu district. Two Pakistani intelligence officials said their agents reported that militants from Central Asia were among the six killed. The U.S., which says Taliban and al Qaeda militants use pockets of northwest Pakistan to plan attacks on foreign troops in Afghanistan, has been blamed in about 20 cross-border missile strikes since August. The U.S. rarely confirms or denies the strikes, which are believed to be carried out mainly by the CIA. The missiles are apparently fired from unmanned planes launched in Afghanistan, where some 32,000 U.S. troops are fighting the Taliban and other militants. Pakistan has protested the strikes as violations of its sovereignty and international law, but the attacks continue, leading analysts to speculate that the two nations may have a secret deal. Until Wednesday, all the attacks since August were in North and South Waziristan, two tribal regions where the government has ceded much of its limited control to militants. U.S. officials say they want to help Pakistan regain sovereignty over such areas. The Bannu district, which falls under the control of the regional government, begins roughly 18 miles away from the border with Afghanistan. Two other intelligence officials, both based in Bannu, said militants had begun moving farther away from the border, including to their district and other settled areas, in an apparent bid to avoid the missile strikes. All the intelligence officials spoke on condition of anonymity because they were not authorized to speak to news media. Pakistani officials say they are rarely warned of such attacks, and have demanded the U.S. share intelligence so that Pakistan can go after targets on its own. Even as the U.S. strikes have picked up, American officers in Afghanistan have stressed improved day-to-day Pakistani cooperation in squeezing militants nested along both sides of the lengthy, porous border. U.S. military officials said troops in Afghanistan coordinated with Pakistan on Sunday in shelling insurgents inside Pakistan who were launching rockets at the foreign troops. Pakistan's official statement on the matter referred only to militant activity in Afghanistan. In the past month, NATO and Pakistan also have cooperated in so-called Operation Lion Heart - a series of complementary operations that involve Pakistani army and paramilitary troops, and NATO on the Afghan side, said Col. John Spiszer, U.S. commander in northeast Afghanistan. "What we have done is worked very hard to refocus our ... intelligence, surveillance, reconnaissance assets to do everything we can to identify transiting across the border," he told a Pentagon news conference in Washington via teleconference from Afghanistan on Tuesday. Commanders hope pressure on both sides of the border will eventually mean militants will be "running out of options on places to go," Spiszer said. U.S. officials have praised Pakistani military offensives against militants in its border region, including an operation in the Bajur tribal area that the army says has killed some 1,500 alleged insurgents. Besides questions of sovereignty, Pakistani officials say the U.S. missile strikes are counterproductive because they often kill civilians and deepen anti-American and anti-government sentiment along the border. But Gen. David Petraeus, the head of U.S. Central Command, has defended the missile strikes, saying at least three top extremist leaders, whom he did not identify, have been killed in recent months in the attacks. Also Wednesday, gunmen shot and killed a retired Pakistani army general who had led military operations against insurgents in the tribal regions. The attack occurred on the outskirts of the capital, Islamabad. Ameer Faisal Alvi was in his vehicle when the assailants opened fire, killing him and his driver before fleeing, police official Mohammed Tariq said. The motive was unknown, he said.